Combines Tsubaki's uniquely developed special coating and special resin coating for superb corrosion (rust) and chemical resistance. Each part of Neptune Chain is individually surface treated -- unlike chains that are surface treated after assembly, Neptune Chains are surface treated right to the innermost part of the chain. Neptune Chain didn't rust after 700 hours in salt spray tests (JIS-Z-2371). 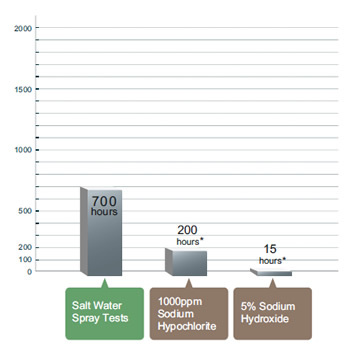 Salt spray tests conducted in accordance with JIS-Z-2371. 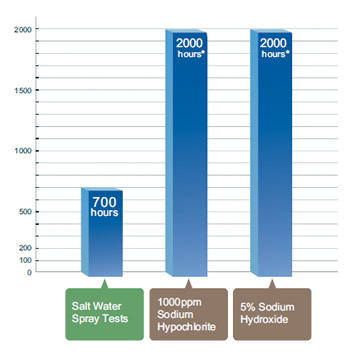 Neptune Chain now has vastly improved corrosion resistance to alkali chemicals that are often used in washdown processes on food preparation equipment. 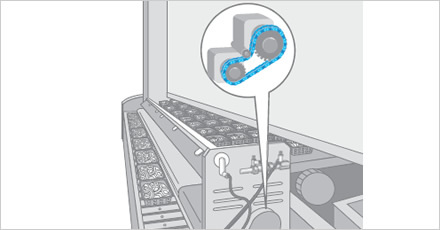 Uses a low temperature treatment so as not to affect chain strength (part hardness). 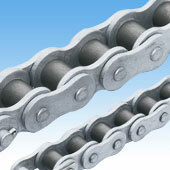 Therefore, Neptune Chain tensile strength and allowable load are the same as with standard steel chains. Surface Treated Neptune Chain uses no harmful hexavalent chromium in its corrosion resistant surface treatment, nor any other hazardous substances such as lead, cadmium, mercury, or arsenic. Neptune chains are RoHS compliant. RoHS is a directive issued by the European Union limiting the use of specified hazardous substances in electronics or electrical equipment. A stainless teel chain that would satisfy the required performance would be too big to fit in the space provided, so the user chose a Neptune chain, which has the same strength as steel chain. Slight amounts of detergent and other chemicals are used in the bath, so Neptune provided a much longer service life than steel chains. Used on a stacker crane for mushroom cultivation. 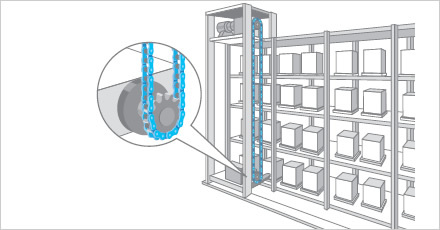 In this high temperature, high humidity environment, standard chains quickly corroded and suffered wear, while the required stainless steel chain would be too big, so the user chose Neptune. This equipment turns raw garbage into compost. The agitator, travel section, and drive of the equipment all use chain, but the corrosive environment (ammonia gas, etc.) 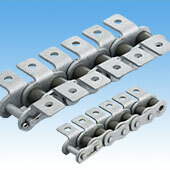 degrades steel chain and shortens its service life. Switching to Neptune has doubled the wear life. 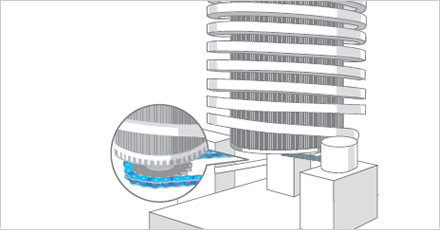 The center of the spiral conveyor rotates and lifts or lowers the conveyed goods. These conveyors are used in high and low temperatures, in contact with water or steam, in contact with chemicals, and many other environments. 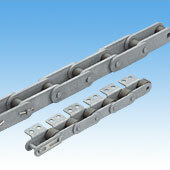 The drive requires a high tensile strength that stainless steel chains cannot provide. Neptune chain, with its corrosion and chemical resistance, solves this problem. 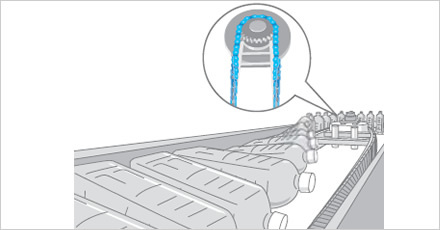 This conveyor conveys food, so there is always a wash-down when different products are conveyed or at the end of operations. Chemicals are used during this wash-down, so we proposed Neptune with its corrosion and chemical resistance. 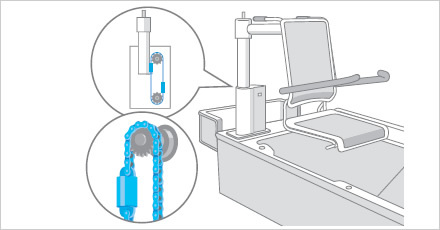 The chain in the drive section is covered but cleaning water and chemicals sometimes splash on the cover -- with Neptune, the user can use their chain worry free. Sterilizes PET bottles. 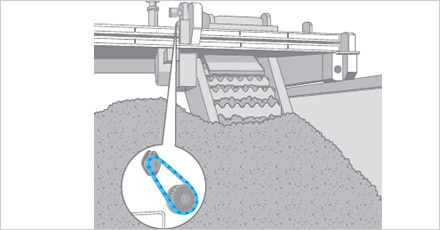 The conveying area uses a special chain that is regularly in contact with water. The customer uses Neptune chain to prevent rusting.